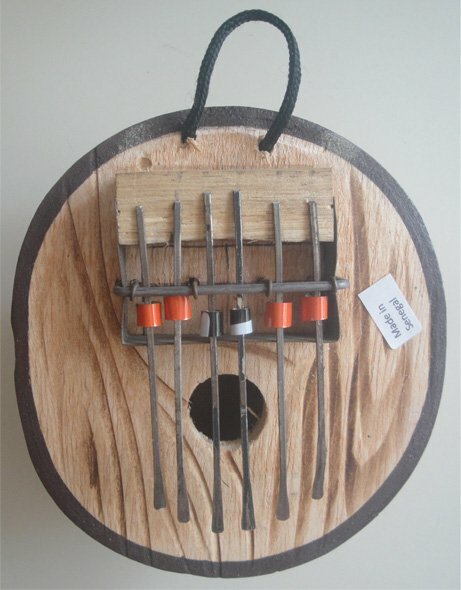 The Kalimba (Thumb piano) is an African instrument consisting of metal tongues attached to a wooden board which are plucked with the thumbs causing metal rings on the board to 'buzz'. The wooden board is mounted on a gourd as sound box this gourd being carved and decorated with an African hut. All of these small Kalimba feature six tongues and a cord loop to carry it the dimension and some decoration details may vary slightly.